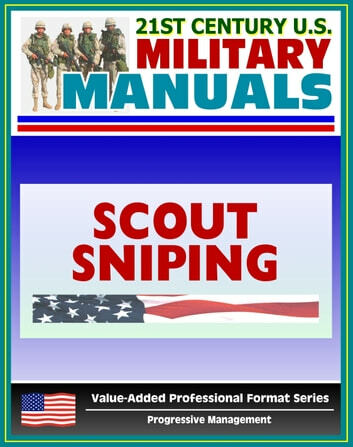 Part of our value-added professional format series, the Scout Sniping Field Manual sets forth the techniques and procedures for selecting, training, and employing scout-snipers within the Fleet Marine Forces. 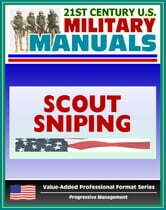 This manual addresses the scout-sniper's selection, training, and equipment and its care. It also provides guidance in the proper and effective methods of employment of scout-snipers. The Marine Corps sniper is a Marine who has been carefully screened, selected, and has undergone comprehensive training in advanced infantry and marksmanship techniques. The sniper's training, combined with the inherent accuracy of his rifle, firmly establishes him as a valuable addition to the supporting arms available to the infantry commander. The scout-sniper is a Marine highly skilled in fieldcraft and marksmanship who delivers long range, precision fire at selected targets from concealed positions. The primary mission of a sniper in combat is to support combat operations by delivering precision five on selected targets from concealed positions. The sniper also has a secondary mission of gathering information for intelligence purposes. A two-man team is the basic operational organization for the employment of snipers. Each sniper team consists of a team leader and a scout-sniper. Candidates for sniper training must be carefully screened. The rigorous training program and the great personal risk in combat require high motivation and the ability to learn a variety of highly technical skills. Potential snipers must have an excellent record and must be carefully screened by their unit commanders to determine their potential aptitude as a sniper.